Black Clergy of Philadelphia, the Philadelphia NAACP, and the Stadium Stompers held a joint meeting to discuss opposition to Temple University’s proposed football stadium. Having been booed into silence at a public forum Tuesday to discuss plans to build a $130 million football stadium in North Philadelphia, Temple University president Richard Englert might be tempted to forget about making a similar attempt to win public support. But that would be a mistake. Opposition to the stadium has been raised to a fever pitch by the university's weak efforts to win more converts. Previous meetings set up by the university to discuss the stadium were with small groups. That may have made the meetings less rambunctious, but it also left out some people whom Temple needs to hear from most. That includes people like Ruth Birchett, a leader of the Stadium Stompers group, who for nearly 70 years has lived near where the stadium would rise. Birchett told Inquirer architecture critic Inga Saffron that she and other North Philadelphia residents think that Temple is ignoring their feelings. They say the 35,000-seat stadium would overwhelm their rowhouse neighborhood. Ironically, had Englert not been shouted down Tuesday, he intended to address those fears. His prepared remarks included a pledge "to have ongoing, regularly scheduled meetings with community members, where there can be real dialogue." He also planned to discuss using the stadium as a "multipurpose facility" serving as the "linchpin" for a special services district with workers to keep the neighborhood cleaner and safer. Instead, the meeting shut down after 10 minutes. Temple should pursue those good ideas even if it does not build a stadium, which is not a done deal. 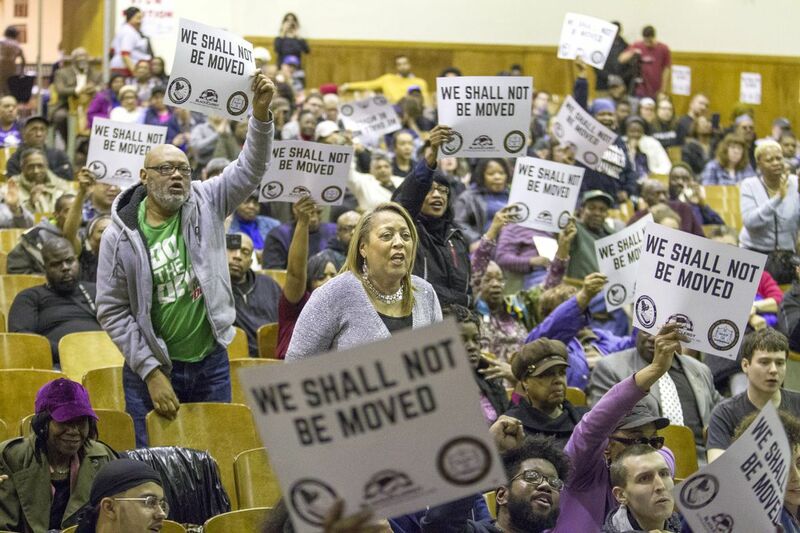 The project must receive Planning Commission approval, which might be influenced by politicians who represent the district, including Council President Darrell L. Clarke and State Sen. Sharif Street. Neither has declared a position on a project that will have so much impact on their constituents. Instead of being coy politically, they could use their influence to bring both groups together. Temple's quest for a stadium has largely been depicted as a way for it to stop paying the Eagles $1 million a year to play home football games at Lincoln Financial Field. But it would cost Temple 130 times as much to build a stadium, so this isn't just about paying rent to the Eagles. Nor is it a case of Temple thinking a stadium would help it join the powerhouse colleges whose football programs are highly profitable. Temple recognizes that with a declining population of high school graduates in the Northeastern states, it must pull out all the stops to compete for students beyond Philadelphia. It no longer is a commuter college, and can't thrive if it's viewed that way by potential students. A football stadium might help it be seen differently and attract more alumni back to campus who would contribute to the school. Temple has a case to make. But it needs to make it to the people who count most – the families who would have to live in the shadow of a stadium if it is built, and deal with the disruptions that such a major change to the neighborhood would bring. The school needs to work harder to assure North Philadelphians that it will be a partner in further improving the neighborhood that they both call home, whether or not a college football game is ever played there.